Jeff Janey has previously served in the United States Army as an attack helicopter pilot and requirements officer. 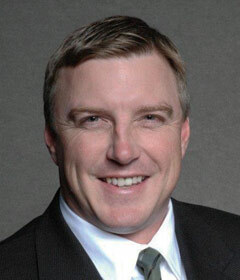 While with ATK, Jeff has worked within business development supporting multiple ammunition, precision weapons, fusing and warhead related programs – both domestically and internationally. Q: I know ATK was recently awarded a sweeping $186 million contract to provide the US Military with ammo, while much of that award remains classified, what can you tell me about it? A: In addition to traditional, direct international sales to U.S. allies, we have created our AmmoBook program. Through our AmmoBook, we are developing partnerships worldwide to help fill production and/or capability gaps for our partners and sometimes for us. Through these partnering agreements, we can leverage each other’s offerings either regionally (domestically) or internationally to offer the customer the best pricing possible while also improving response and delivery turnaround time to the customer. We also offer ammunition services that help U.S. allies maintain a sovereign defense production capability. As a leading developer and producer of small, medium and large caliber ammunition for the U.S. military, ATK understands that creating and sustaining the infrastructure necessary to maintain a domestic ammunition supply is a key component of a sound national defense and security strategy. ATK also understands the steps necessary to develop, maintain and set the conditions for future growth that are necessary to create a viable and affordable ammunition manufacturing complex that will serve both near term requirements and long term expectations. Q: What kind of feedback have you received from unit commanders, or from individual troops, snipers, etc, who have used your ammo? A: The primary response that we are hearing from our ultimate customer, the Warfighter, is that our ammunition has provided them with combat overmatch. While effectiveness is key in a combat situation, just as important is the excellent feedback we’ve received regarding our medium and large caliber ammunition’s record of reliability, and safety – especially given the severe climates and environmental conditions they have been exposed to during combat operations in Iraq and Afghanistan. Q: I could not possibly discuss a feature on “better bullets” or “modern munitions” without mentioning the on-going quest for a true “smart round.” ATK has been on the cutting edge of such tech, in fact in a time of cuts, and austere DoD budgeting, the XM-25 “Punisher” Air Burst system, for which you provide the ammo, was one of the few programs to be continued. Tell me a little bit more about your on-going development and fielding of Air Burst munitions? A: In addition to our XM25 individual weapon and ammunition that is currently in the engineering manufacture design phase, we are also continuing to develop next generation technologies to meet the emerging needs of the customer to counter future threats from 30 and 40mm weapons platforms. An example of that technology is through our Mk310, 30mm Air Bursting Munition (ABM). The ABM round provides ground and naval platforms armed with our MK44 cannon the capability to engage a vast number of targets with greater lethality than traditional point detonating high explosive ammunition. 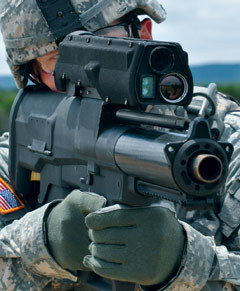 For the XM25, we have developed the high explosive air burst (HEAB) tactical round and the target practice (TP) round. We’ve also had internal discussions on the future of the weapon system where the XM25 could make use of specialty rounds such as non-lethal and breaching. Q: And you are also particularly proud of the latest advances in your Auto Cannon line, tell me a little more about that system, what is new and improved? A: We are seeing that there is a trend in the desire to upgun combat vehicles. Our 30mm/40mm Mk44 Bushmaster® Automatic Cannon fits this need in that it is an easy and relatively inexpensive conversion for existing cannons or for future consideration when developing new combat vehicles and weapons platforms. As an example, a MK44 cannon can be converted from 30 to 40mm in a field environment by the combat vehicle crew in about 30 minutes by simply replacing the barrel and four other parts (primarily related to the feed and recoil system). Having the option to transition between 30 and 40mm also provides the opportunity to more economically train with 30mm and then fight with 40mm. Additionally, the 30 to 40mm conversion could prove useful in the event of task organization and the logistics required to support multiple ammunition calibers. Q: Without revealing anything that may be proprietary, what is next in the development of your ammo? What do you see as the future of ammunition as relates to US and worldwide Soldier Modernisation programmmes? A: We work very closely with our customers to understand their emerging requirements so that we can better understand current and future threats and how we can help counter them – either through existing capabilities, improvements to current ammunition, or, when necessary, the creation of new ammunition. Right now we are in the EMD phase of developing the next generation kinetic energy 120mm tactical tank ammunition – M829E4. We expect that we will be approved for Milestone C later this year and then begin transition to production and Low Rate Initial Production (LRIP). The M829E4 will provide the Abrams tank with a next generation overmatch capability necessary to defeat the protective armor of today’s most advanced protection for main battle tanks as well as predicted armor protection for the foreseeable future. Also in tank ammunition, we have submitted our proposal for the U.S. Army’s 105mm KE Trainer for the Stryker 105mm Mobile Gun System. We expect to hear a decision on that competition in late summer to fall of this year. Additionally, we will apply our core competencies in tank ammunition warhead, fuzing and our 30 plus years of experience in the overall design and qualification of tank ammunition to respond to the US Army’s RFI for an Advanced Multi-Purpose 120mm round (AMP). The Army has scheduled an industry day on 30 April for AMP. We’ve also recently been working in the recapitalization M865 120mm tank training ammunition. Through this program, we have refurbished existing M865 training ammunition for improved safety and usability and so that existing stockpiles will have a greater period of use. Q: Over the last few years at Soldier Mod, we have reported often on DARPA’s EXACTO initiative, ATK is actively involved in that programme, can you give us an update? A: Yes, we are partnering with Teledyne and working through a DARPA contract to develop a guided .50 caliber sniper round – the Extreme Accuracy Tasked Ordnance (EXACTO) round. For military snipers, acquiring moving targets in unfavorable conditions, such as high winds and dusty terrain, is extremely challenging with current technology. It is critical that snipers be able to engage targets faster, and with better accuracy, since any shot that doesn’t hit a target also risks the safety of troops by indicating their presence and potentially exposing their location. The Extreme Accuracy Tasked Ordnance system seeks to improve sniper effectiveness and enhance troop safety by allowing greater shooter standoff range and reduction in target engagement timelines. The objective of the EXACTO program is to revolutionize rifle accuracy and range by developing the first ever guided small-caliber bullet. The EXACTO 50- caliber round and optical sighting technology expects to greatly extend the day and nighttime range over current state-of-the-art sniper systems. The system combines a maneuverable bullet and a real-time guidance system to track and deliver the projectile to the target, allowing the bullet to change path during flight to compensate for any unexpected factors that may drive it off course. Phase II included the design, integration and demonstration of aero-actuation controls, power sources, optical guidance systems, and sensors. The program’s next phase includes a system-level live-fire test and technology refinement to enhance and improve performance.